Year 2009 is a bountiful year for the Local Government of Sta. Cruz Adventure Club (LOGSAC). Except for a terrible experience suffered by Julpanz and Papong at Tibolo on July 18, the rest of the experiences can be summed up into one word – SUCCESSFUL. Several individual achievements also formed part as our milestones. Here are the top ten main events and achievements that LOGSAC has reached in its two years of existence. 10. Mt. Matutum Amyak Maleh .Tailing the list of the club’s accomplishment in 2009 was the expedition to South Cotabato’s highest peak. March of every year is Mt. 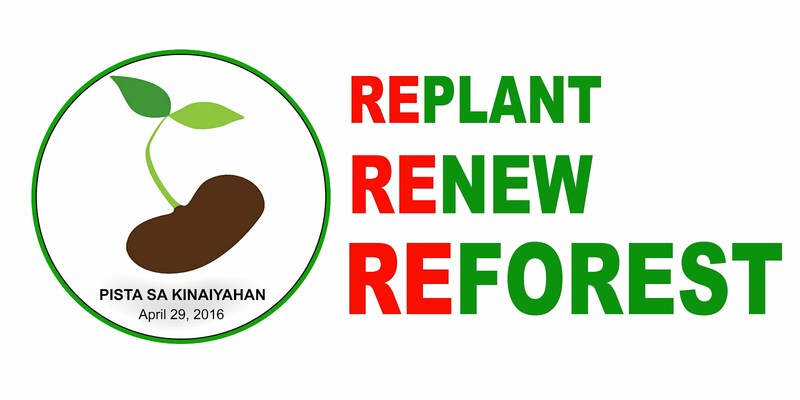 Matutum month, an initiative of the Local Government of Tupi, South Cotabato to save and protect Mt. Matutum as a major watershed of South Cotabato and Sarangani provinces. Two of LOGSAC’s pioneering members Jonas and Papong had joined this years’ edition of Amyak Maleh Matutum via Glandang Trail. The event was highlighted by a tree planting and clean up drive. 9. Sulop Outdoor Adventure Trip. 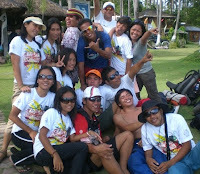 This event was spearheaded by the Apo Mountaineering and Outdoor Sports Society (AMOSS) last December 19-20, 2009 at Barangay Osmeña, Sulop, Davao del Sur. 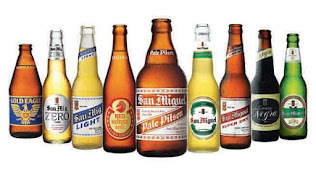 Basically it was coined to provide outreach program to the Tagacaolo tribe of the said place. Since AMOSS and LOGSAC share the same thrust, we eagerly joined the event and sponsored some medicines for the medical mission. On the second day, there was an adventure descent to their yellow river and Osmeña cave. However, there was more than to the trip than the usual outreach program and adventure tour for which I and TEAK leader Gabo only knew. 8. Operation Kontra Baha. An initiative of the Knights of Columbus Catalunan Grande Chapter, it is a flood mitigation project of the three major rivers in Davao City namely; Talomo, Matina-Pangi and Davao Rivers. LOGSAC’s participation came right from the very start of the planning phase, including the technical survey, post-data processing, stakeholders’ workshop and the actual tree planting from last week of October until November 23, 2009. On the succeeding date schedules, the club will still be joining the most important part of the project which is the parenting stage. No doubt about it, this is the event which LOGSAC should take part by hook or by crook. An annual event of the Local Government of Sta. 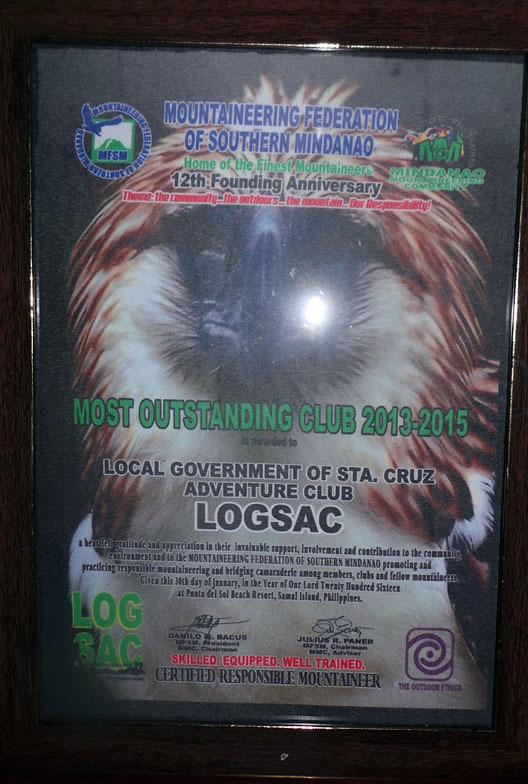 Cruz, Davao del Sur conducted every last week of April for conservation and rehabilitation of Mt. 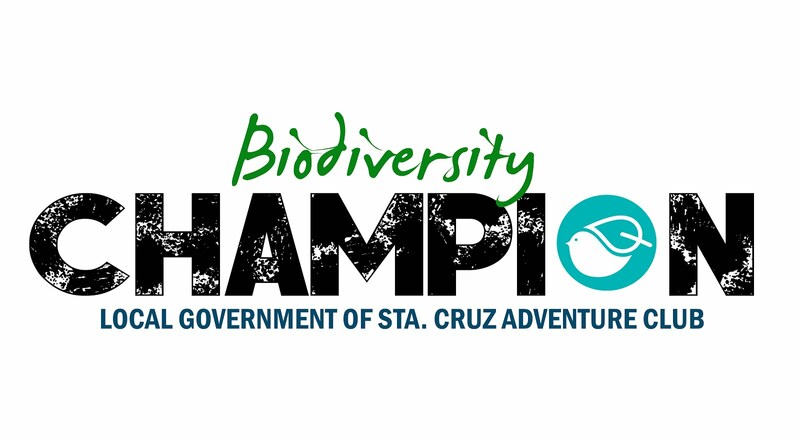 Apo Natural Park through activities like tree planting, clean up drives, boulder face challenge, waste recycling, skimboarding competition; among others. The main activities co-spearheaded by LOGSAC was the Boulder Face Challenge (a 24-hour extreme adventure challenge from Sta. Cruz beach lines to the skyline of Mt. Apo’s boulder face through disciplines of mountain biking, trekking, water tubing, road running and mind twister) and Duaw kay Apo Expedition. This is an event where mountaineers from all over Southern Mindanao are convened together for a common purpose of fellowship, camaraderie, advocacy and festivity. Organized by the Mountaineering Federation of Southern Mindanao (MFSM) and Department of Tourism XI, this year’s congress was held at Punta del Sol Resort, Island Garden City of Samal last May 30-31 and was participated by more or less 800 mountaineers. As an inevitable getaway, LOGSAC joined it and enjoyed the event with no limits. With us on the surface, the whole place was filled with cheers and laughter. 5. Mt. Apo Holy Week Monitoring. 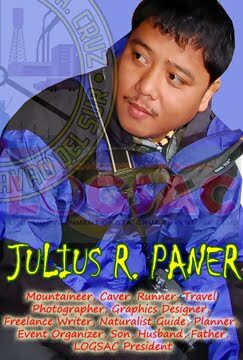 Three LOGSACs used to overcome the hurdle of apprehending illegal climbers during the Lenten season of 2009 just to make sure that Mt. Apo would be free from everything bad. Papong, Jonas and Julpanz had established a base camp at Colan for the monitoring activity along with the Philippine Army and DENR. The result? We apprehended some 30 unregistered climbers and had it subjected for appropriate actions by the LGU. For the record, Mt. Apo has been abused by illegal climbers, and we cannot continue to tolerate this because the mountain is not a superhero. It also has its time to rest given with the many burdens it used to carry. That’s why we made sure that the carrying capacity should be imposed. That’s the very essence why a Lenten season monitoring should be done. On October 18, I represented my club to the Launching Program of the Dayang Beach Adventure Island along with some officers of MFSM and the Wind and Wave. It was ended a very good experience that I should include it here in this yearend story. For those who missed the place, it is part of the Talicud Island in IGACOS and it is simply irresistible. It is a must-see to all water adventure seekers and nature lovers. Adventure island offers the following: scuba diving, island tour, coral tour, beach volleyball, snorkeling, island trekking, wind surfing, rappelling, sunset cruise, sports fishing, aqua bike, spelunking, cave tour, bird watching, kite boarding and mountain biking. 3. Mt. Apo February Expedition . Rounding off the third place of this essay is the Mt. Apo February Expedition on February 25-28 which was conducted along with the Municipal Council for Tourism, Culture and the Arts and some guest mountaineers from Samahan ng Mountaineering Barkadas of Luzon. There were 49 members who joined the expedition. The climb was welcomed by a very burly rain showers that we weren’t able to follow the itinerary. It was the first time we had an emergency camp at 87 degrees of the boulders with no water source. What made the expedition electrifying was that we were clasp by extreme coldness along the trail and some of our companions were left at Tinikaran Holding Camp 2. 2. Mt. Apo Freedom Climb. This is a tribute climb to our freedom fighters with a slogan Filipino Mountaineers stand United, conducted last June 11-16 at Mt. Apo. As free as its name, we did everything during this climb with so much autonomy. We drink a lot, got drunk a little. Laugh a lot, suffered stomach tantrums a little. Shout a lot, reprimanded a little. Took a rest a lot, trekked a little. That was just how we acted in a climb that was more of a pleasure than dissatisfaction. The climb was also graced by a boorish model whose unawareness was our delight. If you missed this climb, you missed our joint laughter when somebody used the mouthwash as a beverage. 1. Tudaya Falls Clean Up Drive . Simply put it there. 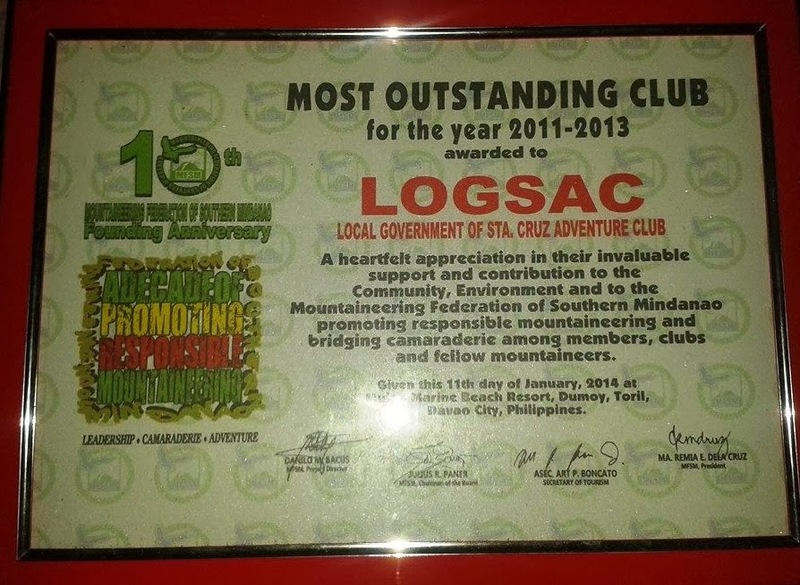 Our clean up drive to Tudaya Falls tops the list of accomplishment of this young outdoor club. We have gathered approximately 100 kilograms of garbage from its basin and trail. The clean up was part of LOGSAC’s advocacy on environmental conservation and rehabilitation during its 2nd Founding Anniversary. There was also a community awareness campaign to the Bagobo-Tagabawa tribe of the place for them to be educated about the ill-effects of environmental degradation. Wow! !verY ImPRESSIVE!! !kip it up!!! !more article pls..